Long before the bar, chocolate was first consumed as a sugarless beverage prized by Mesoamericans. Xocolatl is the original word for chocolate in the Nahuatl language spoken by the Olmecs, Mayans, and Aztecs. 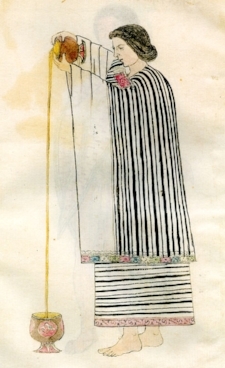 It remains a debate which of two pronunciations was used first, "cho koh laht uhl" or "sho koh laht uhl". Xocolatl is composed of two words: xococ, meaning bitter, and atl, meaning water or drink. This bitter water was a mixture of crushed cocoa beans (seeds of a Theobroma cacao tree), water, and spices. In Spanish writings, it was later discovered that both the Mayans and Aztecs described cacao as a gift from the Gods. Due to the energy and mood boosting properties associated with the drink, xocolatl was believed to be mystical and healing. The beverage was primarily consumed by royals and nobles, and was also reserved for sacred ceremonial rituals. Cocoa beans were also used as a form of currency. *To dig deeper into the rich history of chocolate, visit my resources page or check out the references listed at the bottom of this post. 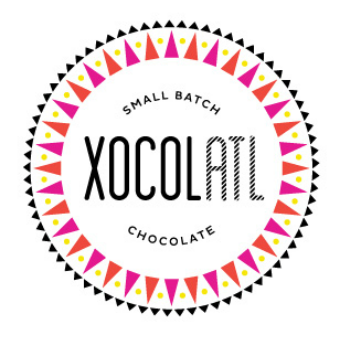 Today in a city with its own rich history, Xocolatl is known as Atlanta's small batch bean to bar chocolate maker. Emphasis on the ATL as a nod to Atlanta. Coincidentally Atlanta is one of several cities affectionately nicknamed a "Chocolate City". A "Chocolate City" is not a reference to the coveted chocolate or confections made there. Washington D.C, Memphis, Detroit, and New Orleans for example, have also long carried the nickname as an affectionate referance to a predominantly black or African American population. Over time demographics have and will continue to change, deeming the nickname questionable in some areas. Before going too far down the rabbit hole, I'll get a little more personal. In observance of today's holiday, Martin Luther King Jr. Day, (and another special day in my life that I will let you guess) I am sharing some highlights of my recent trip to the neighborhood where he grew up. I promise this has everything to do with chocolate. It was mid-swelter-mid-August in downtown Atlanta when I stepped onto the BeltLine —the city's first shuttle of its kind— and stepped off at Historic Inman Park. Exploring the historical sites honoring our civil rights heroes was my primary interest on this trip, but when I read that there was a bean to bar chocolate maker in the area, priorities were rearranged. I was on my way to Xocolatl Small Batch Chocolate, nevermind the humidity. Few things get in the way of a girl and her chocolate. On the way I did lots of stopping to admire the little things. Especially in the shade. These mini pop up libraries are one of my favorite things to find in my travels. I did not take any photos of the historic houses. It isn't illegal, but it didn't feel right to me. Imagine gingerbread lacing, pillars, and large inviting porches. Throughout the neighborhood the contrast of preserved Victorian architecture and modern art was notably sharp. With teeth. Skillfully, I managed to escape this monster garage and continued on. Looking back, I do regret that I didn't get the name of their dentist. Eventually I arrived at 99 Krog Street. Not everyone in the neighborhood wants to eat you. People here are generally welcoming. They want to eat well. They want you to eat well. Some even want to eat with you. Here, under one roof, was something new to me. In the heart of the neighborhood, is a place where the community can come together in what I can best describe as an indoor farmers' market meets modern food court, exclusively offering goods (mainly food) from craft artisans. No chain stores. No vibrating apartment complex full of tenants dawning headphones directly on top of it. It's a safe place close to home for people to meet, enjoy a meal, find a gift, or just hang out. A sense of community hasn't been strong everywhere I have lived or visited. So for me, it was mild culture shock. Like peeking into the future. Community: coming soon to a neighborhood near you. Well, these ones do anyway. And when they don't I am lost. Xocolatl was intimidating to pronounce at first, but their chocolate makes me sing. In the following interview Matt and Elaine warmly share their story of chocolate and trouble making. The good kind. Elaine: We met in 2004. We were both working on grassroots organizing for the Democratic National Committee for the elections in 2004. I was based on the East Coast and Matt was based on the West coast. The organization that we had, we would get together once a month for trainings and meetings, and things like that. So one of the trainings, Matt and I met. We worked through the end of the election. And then when that was over is when we backpacked through Central America. That was sort of our beginning. Matt: At the time we weren’t into chocolate, I mean we liked chocolate, but we weren't going to Central America to learn about chocolate. In fact, I don’t think we saw —that I’m aware of— I don't think we saw any cacao trees or anything, or we weren’t on the lookout for it. Elaine: At that point we might have passed them and not even recognized them. At what point did you become interested in cacao? What lead you into chocolate making? Matt: Well that was much later. We kind of traveled through Central America in 2005. Then we came back to the states. Elaine worked for a couple different organizations focused on international aid and relief. I did progressive and Democratic campaign work. We kind of did that in 2006 into 2012. I worked for Congressman John Lewis who represents Atlanta. He’s amazing. He’s the last living speaker from the March on Washington. He was the head of the student non-violent coordinating committee in the 60s, and he lead the Democrats' sit in on the floor recently, over gun control. That was the last campaign I did. Matt: We had talked for a long time. I mean, Elaine and I had traveled together in Central America when we first met, but even prior to that Elaine had done Peace Corps, and Malawi, and I had studied abroad in Kenya and Tanzania. We both individually had done a lot of traveling and we'd always talked about spending more time outside of the country. We had one kid already, and Elaine was pregnant with our second kid. We kept on putting it off and putting it off. We just decided there is never going to be a perfect time to sort of pack up and leave, and we just decided to go ahead and do it, and still did not know anything about chocolate. But we went down to Costa Rica. We were down there for 7 or 8 months. Elaine: We had set up a t-shirt printing company which was going to be our way of funding ourselves. We had rented out our loft. We were kind of sustaining our finances here. And then we had no background in printing, but we somehow opened our own t-shirt printing shop. Matt: That we were going to do remotely, which didn’t make any sense. Elaine: So Matt is not a designer at all. It was a lot of clip art. Matt: It was all clip art. Elaine: We got a contract for a County Parks and Rec basically, so we were doing t-shirts for their soccer camp. It didn't need be particularly designerly. We had rented a house specifically with a reasonable internet connection so we were able to do that. We realized we were in the jungle, stressing out about t-shirt designs that we could barely manage. The internet would go in and out. At some point, we were like, we can't do this anymore. So we closed up that business. Matt: So when we went down to Costa Rica we were kind of open ended. We wanted to figure out if we wanted to stay. Elaine: We were like, we might do it for 6 months, it might be a year, it might be indefinite... it was completely open ended as far as what our plan was. Matt: We were on an extremely limited budget. We were in a little town called Puerto Viejo, which is almost on the border of Panama. It's a really nice little town, and it's got a really nice culture of locals and expats who are both very welcoming. I feel like—at least in the traveling that I’ve done—you won't always find that. You might sort of find an expat community that is very standoffish to anybody new. Elaine: Or it's not integrated with the locals. Matt: This had a very positive vibe to it. There was a farmer’s market in town that we would go to. Our treat was we would buy chocolate from Caribeans Chocolate, which is a little local chocolate maker there right outside of Puerto Viejo. Elaine: Xocol means bitter and atl means water. As far as choosing the name we wanted something that had a connection to the origin of chocolate, and then of course ending in ATL, it was sort of too perfect. Except for the fact that it's a word from a mostly dead language that starts with an X. So we were like, you know, is this going to be a good marketing move? Matt: No one’s going to be able to pronounce it. Elaine: We pronounce it chocolatl. As the word got taken and adopted by the Spanish when they brought over cacao, the way you pronounce the X is more of an S sound. We've done some research and talking to a couple of ethno-linguists, and it seems consensus is split between whether the original pronunciation is pronounced shoc or choc. In the Nauhautl language it's definitely more of a harder sound than the Romance language. Matt: I think we liked that it referred to the origins of chocolate. And the ATL was nice. We felt like part of our mission with the company is to help support and develop community both in the country of origin where we get our beans, and also here in Atlanta, and sort of bridge that which the name does as well. Because people don't know how to pronounce it, it’s a conversation starter. So many people don’t know where chocolate comes from, or don't know anything about chocolate. We do a lot of customer education. That's also why we have our shop set up the way we do. What is the number one thing you want others to know about chocolate? Elaine: For me, there are three things I want people to know. I think the first thing is a little bit more general and people are increasingly knowing this, but knowing that chocolate comes from a natural food source. When we were growing up I remember my family took me and my brother to the Hershey factory in Pennsylvania. The whole industrial chocolate making process is so opaque for a lot of reasons. Industrial chocolate does not provide a view into how chocolate is made or where it comes from. You naturally grow up thinking it's this man made candy. You don't consider that it comes from a natural food source, and then it turns out this source is really good for you, and there are all these health benefits associated. When made in a certain way, chocolate is actually good for you. So to go off story, I never was a big chocolate person growing up. If I was going to get a dessert, it would have been more like a fruit or like a fruit pie. Chocolate never really called to me until I was pregnant with our son. The only food craving I got was for dark chocolate. I tried to find chocolate that wasn't loaded up with sugar and milk, or fake ingredients. I started having chocolate every night, like a piece of it. Not too long after he was born I started learning about the child labor and child slavery issues, and the exploitation of workers. At this point I became a big fan of dark chocolate, so I would look on the backs of bars and try to find bars that said anywhere where the chocolate was coming from. This was in 2009-2010. I was looking at the bigger boutiquey bars thinking that chances were they would have better sourcing. I couldn't find anything. There were companies doing ethical and transparent sourcing, but I just wasn’t finding them at the time. I ended up just giving up chocolate. I was like, well If I can't feel good about where it's coming from then I can't buy this thing I suddenly love. Then fast forward into Costa Rica, becoming friends with Paul at Caribeans, and Peter and his wife at Talamanca Chocolate, we started to eat dark chocolate again because we could clearly see how the chocolate was made and how it was being sourced. The ethical side of the sourcing is something we want to convey, but when someone comes to the counter I don’t want to just lay on them this really heavy story. Whether it's ours or someone else's, you have to get craft chocolate for the social reasons and the environmental side too. It's not even Hershey's or Nestle, it's the large agri-businesses they buy cacao from who are literally deforesting the Amazon currently. Until someone stops them it's just wrecking our planet. So we're still figuring out how to tell that story. Those are sort of the three things. But it is really tricky to tell that story. Matt: Showing people how chocolate is made, I think the whole point of it is to get people to have a new appreciation for chocolate and the labor process that creates it. I think showing people what it takes to take a bean and make it into a chocolate bar also helps us tell the story of the work that the farmers are doing, just how much work it takes just to get it from the tree to us, as opposed to a dollar snicker bar off the shelf. I’m not saying people should stop eating that entirely, but just to think about it. I think that's true about all of our food, not just chocolate. There's a reason McDonald's can sell beef for one dollar. It's just a part of the bigger issue of being aware of where our food comes from and having an appropriate value for the food. Matt: Our whole process is on display for everybody, so we don’t have any secrets. We have a really tiny factory. Our production space is about 250 square feet. Everything happens in that space. We sort the beans, roast the beans, crack and winnow, grind the beans, temper, mold, cool and set, and then hand wrap them all in that space, and it’s all visible to the public. There are a lot of constraints, and things we would like to do differently or improve upon, or steps we certainly would like to add. We are in the process of looking for more production space. Elaine: One thing that our space constrains is being as efficient as possible. We can basically only do one batch at a time. Although we'd like the luxury of letting our chocolate age a little bit longer, we've become very efficient at transferring the chocolate step to step. We don’t have the space to have batches and batches of chocolate. Matt: I think we'd like to have a conche or a three roll mill to further refine the chocolate after it comes out of our CocoaTown grinders. We'd like to have a drum roaster. Right now we're roasting in a convection oven. I feel like we're making pretty good chocolate, but I think we both feel like we can make better chocolate. I guess everyone's goal is to continue to improve. We've got room where we can improve here, but if we could get into a bigger production space that would really help a lot. Elaine: I can't really see that there's a point in the learning curve of chocolate where we're going to have it fully mastered. I think that's the intriguing challenge of chocolate. It seems like there's infinite room to get better. Also because we are sourcing our beans from small producers harvest to harvest there's a lot of variation. Matt: Or bag to bag. It’s a lot of on the fly flavor adjustment to be able to work with the different flavor profiles we weren't necessarily expecting. Most unusual chocolate you have ever had? Matt: I like Raaka. They're not that hard to find. They don’t roast their beans. They don't call it raw chocolate because during the ferment, and I think 116 degrees is the cut off point for raw food standards and it'll get hotter than that in the grinder, but by not roasting the beans they have a very earthy fermenty flavor to their chocolate. I think everyone should try unroasted chocolate. Elaine: At the time it was completely foreign to me but now I've taken it for granted. It was the first time I had dark chocolate that didn't have cocoa butter in it. It was actually the Talamanca Chocolate which we got at the farmer’s market in Puerto Viejo. We were on an extremely tight budget. Most of our money was going to food and two kids. The dark Talamanca chocolate was like the one luxury thing we splurged on. These were tiny. Elaine: The longer we were there it would go from one bar to two bars. I'm not even sure if I liked it. I remember the first time biting into it and not comprehending what I was tasting, but I recognized that it felt good, like it felt like it was clean food and it was interesting. The more I had, the more I flipped over into loving it. It was really that first moment of having craft chocolate that was awesome. Do you have a favorite kind of chocolate or cacao? Elaine: Within our own chocolate my favorite is always the newest thing we're making. Other people's chocolate —especially when we travel—is anything that's new. We love tasting what's out there. Matt: What’s the one we have upstairs? Soconusco 70%? The Crillolo? Elaine: Soconusco. I got it at Alan's. It's the name of a region in Southwestern Mexico. Matt: It's just really nice. I had that a week ago, so that’s currently mine. Matt: I think people should eat whatever they want. Elaine: Chocolate and wine, chocolate and beer, chocolate and sake, all of that’s fun, and I would never tell anyone not to have fun tasting chocolate, but as far as for me, trying to really taste a chocolate, it’s best not paired with anything. A certain wine might bring out flavors in a chocolate you might not have tasted otherwise, but If I just want to taste chocolate on it’s own I wouldn’t pair it with anything. Matt: Trying that Caribeans. It was all so beautiful, sitting on the side of a hill looking over the Caribbean ocean. It was so striking, eye opening. It was this epiphany. Elaine: It's the same for me. It was the one thing we were splurging on. It was hot. it was total luxury. That moment of first biting into it, not really knowing what to make of it, yet it came really quickly that I grew to love it. Matt: I feel really lucky to be part of the craft chocolate community, especially coming out of politics. There are a lot of good people involved in it. It feels like we have a lot of room to grow, but there are also a lot of other people who support us who are in the same line of business we are. That’s not the case in a lot of other fields. Elaine: Encourage people to buy craft chocolate. Ok fine, the grocery store chocolate once in a while, but chocolate was always such a valued food in history. It was only when it became industrialized in the 1800s that it started to fall off the cliff. I think people should buy craft chocolate. Before leaving, I ordered their frozen drinking chocolate for the road. This experience was my favorite souvenir. Anything but bitter. If you have made it this far down the page, then you reader, are the thorough type whom I admire and aim to reward. Kind of like dessert on the house. In conversation after this interview, Elaine shared with me that roughly three blocks away from Krog Street Market, both of their children were born inside their home on Sweet Auburn Avenue, just a few doors down from the Queen Anne style house where Dr. Martin Luther King Jr. was born in an upstairs middle room. For a while, I played with the idea of boasting that personal fact as the introduction to this post. But it didn't feel right to me. It felt rude, like a ploy to bait readers. The very same goes for the observance of today's holiday, Martin Luther King Jr. Day. I find it not only important to visit historical sites or to revisit the words of our civil rights heroes, but to also look around where you are. Look within. *To dig deeper into the history of chocolate, I highly recommend reading this book: The True History of Chocolate by Sophie D. Coe. and Michael D. Coe. Or for a quick review, check out this historical timeline from C-spot, one of my favorite chocolate resources.